With a fun, wacky and just downright kooky style, the 11 x 6 Emma Axi Playhouse is one of the most unique and fantastic looking playhouses out there. Not only does this have a very wild style, it also offers plenty of room to play. Make no mistake about it, the actual playhouse is very large and will provide the kids will just a ton of space to make use of. Just outside the playhouse is a nice, long decking area that has a railing to make sure the kids can play safe on there. The left and right of the playhouse is where the fun features are, on the left is a small, but safe ladder for them to climb. On the right they can get back down to the ground with some style thanks to the slide. While the design is a little out there with its unique style, it is also very cleverly designed and it has been built to last. Thick, tongue and groove cladding and a solid frame is what keeps this all together. The roof is a great mix of apex and pent styles and will ensure the rain and snow stays out and the floor is more than strong enough to handle the most wild of kids parties. In all just a tremendous job has been done in making this a strong and fun playhouse. 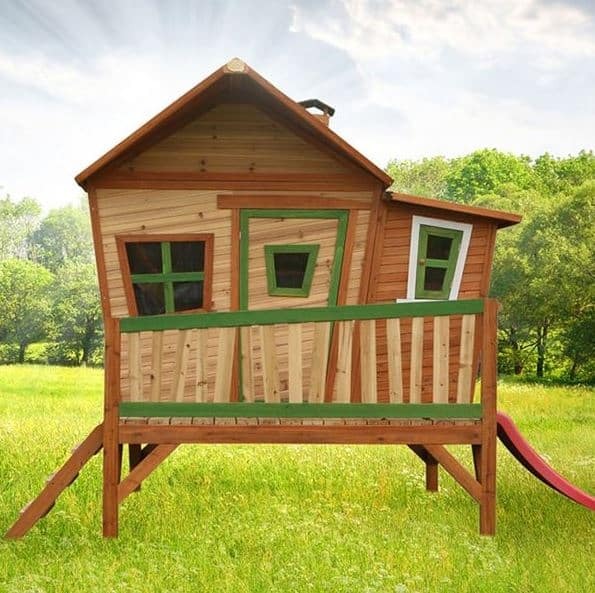 The 11 x 6 Emma Axi Playhouse really is one awesome looking, large child’s playhouse. We really love what they have done with the design here. It has a log cabin look, but the kind of log cabin you would expect to find in some kind of kooky kids TV show or book. 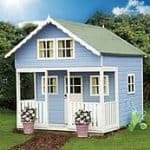 This is one large playhouse, as a matter of fact the whole structure is one of the larger ones from from Axi so you will need a decent sized garden to house this. The depth is 5 feet 10 inches, but the width, due to the slide and ladders is, 11 foot 1 inch. The actual playhouse is a very good size and it actually has another part added onto it to give it more space than the smaller versions of this playhouse. The roof is very high so there is plenty of headroom inside here, actually the whole playhouse is quite tall, this is a tower playhouse that stands an impressive, 7 feet high. 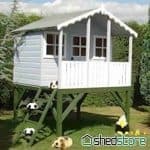 As well as being a playhouse that has a ton of space inside for the kids to play, this one is also full of fun features for the kids to play with. 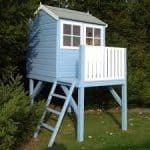 On the left of the playhouse there is a small ladder which is made with solid wood and has these thick rungs to make climbing up it easy, even for smaller children. On the right side there is a ladder, this is a wavy style slide so again it is perfect for younger children who you do not want going too fast down it. In between these is a decking area, we have seen this same decking area on smaller playhouses from Axi, but thanks to the added section on this one, the decking really does feel extra large. There is a safety railing on the decking that has a really unique, crooked look to go with the rest of the structure. Axi have gone for a timber based apex roof and it is just amazing. It is not only going to be very strong and keep the snow and rain out, but it also looks fantastic and as it sticks out at the front the decking gets a little bit of protection from the weather. As there is that extra part of this playhouse on the right there is actually another separate roof used for this and this one is a pent style roof. This sounds very odd, but as you can see from the picture it works and fits in with the kooky style of the rest of the playhouse. Also the design from a practical point of view is very clever as the rain will run of the main apex roof onto the pent roof and then straight off that. 15 mm thick tongue and groove cladding is what makes the walls and we really could not be any more impressed with its strength and its style. Axi, clearly had a lot of fun making this playhouse and that extends to the cladding. On the front of the playhouse they have put the cladding at a different angle to go with that crooked look the rest of the playhouse has. We just wish they had done this on the extra section as well, but the fact that is more straight does make the wacky looking cladding stand out more. To keep the playhouse together and standing strong for many years is a very well made 38 mm thick frame. We always like to see a solid frame, especially on a playhouse as we know it is going to take quite a bit of punishment. You will have no concerns over the long term stability of this playhouse thanks to the frame. Just like the rest of this playhouse, the floor has had a lot of effort spent making sure it is just right. Inside the playhouse and on the decking the flooring is strong and is able to handle kids jumping around going crazy. The playhouse will be given a very basic form of treatment which will look after it during the delivery and while you install it, but shortly after construction, no more than a week we would say. You will need to give it a good coating of wood treatment to make sure it is going to stay free from rot. A new coating each year is all that is required to keep that gorgeous looking wood smooth and rot free. This playhouse comes with a three year manufacturers guarantee. This will look after the wood in case of rot or if there is any issue with the materials. The door from a practical point of view is very well made. It is wide and high enough that the kids will be able to get in and out easily. However it is the style of the door that really makes it stand out. With a crooked design, the door looks like something from movie, The Cat In The Hat. It has a fun window that is also crooked and because of the extra part of this playhouse the door is almost right in the middle which we really like. Plenty of fresh air and natural light will get into the 11 x 6 Emma Axi Playhouse thanks to the generous amount of shatterproof acrylic windows that are on the playhouse. On the front of the playhouse, including the door there are three windows. The one on the left is large and fixed, whereas the one on the right is a little smaller and can actually be opened. Each side of the playhouse has a larger, double window which can be opened and these use a very clever magnet mechanism to close securely. We really love the look of these windows and we cannot think of another line of playhouses that has windows that look like these. No lock comes with this playhouse, but we would not actually advise you putting one on anyway. Still this is a fairly secure playhouse as the windows and the door are able to be closed pretty firmly. We would still not recommend letting the kids leave expensive things like iPads or pricey toys in here, but in general it does offer more security than most other children’s playhouses. 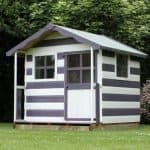 Anything this large and with such a wild and crazy style is always going to get a lot of attention so it really is not going to offer your kids much privacy, but we are not going to slate the playhouse for this. Kids will love showing this off and probably insist any adults who come round have to come and see their awesome playhouse. No customisation options are available, but you could always make this even crazier by using a bright coloured wood treatment or maybe even painting it a few different colours. 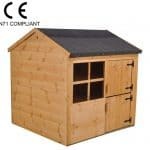 A whole host of extras are available with this playhouse such as the name tag that can go on the outside and the fun chalkboard which can go on the inside, these are available for £29.95 each. 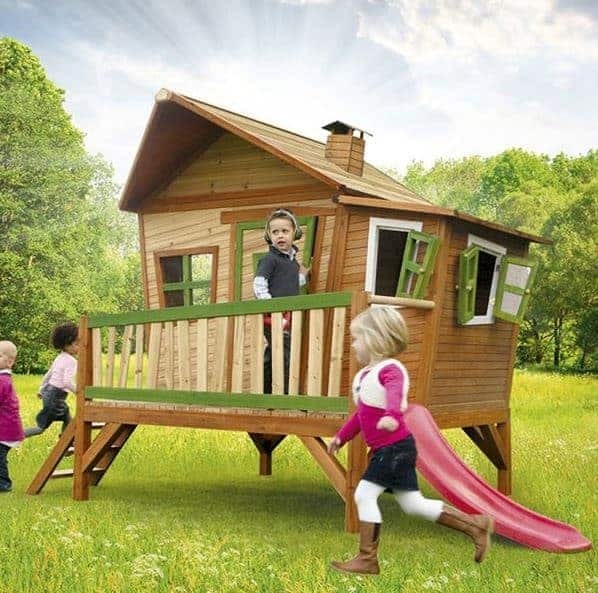 This is a very large playhouse so we do not see the wind budging it at all, but if you are worried about this blowing away down the A1 then there is an anchor kit that costs £54.95. For £34.95, you can add a flower box which would look great either under the window or on the decking. The last extra is a solar panel kit that will actually give your kids a little bit of power in the playhouse. This costs £74.95 and will also probably blow your mind that the kids actually have power in their playhouse. This is very well made and we are genuinely impressed with how despite the large side, Axi have managed to keep this high quality all throughout. Axi have used the right kind of materials for this playhouse, your kids are going to get many years of enjoyment out of this and if you make sure to treat the wood, then it will stay looking smooth and wacky for many years. The extra section added onto this playhouse may look weird, but weird looking is what this is all about. 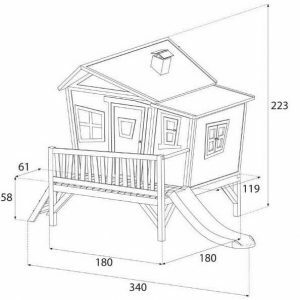 Plus it adds an extra couple of feet to the playhouse which will make this feel like a mansion to the kids when they are inside. The decking is also made larger thanks to this extra section, so all around there is a lot of space for them to use. Now this is not what we would call a difficult DIY job, but it will take a while to build, up to 6 hours or maybe even a little more. Just make sure you have a friend to help and some good music on the radio and this will be a fun experience. At a little under a thousand pounds, we know this is not cheap, but we still believe that this is great value for money as it is made with fine materials, is a very good size and of course it looks amazing. 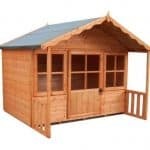 Final Thoughts: We just love the look of the 11 x 6 Emma Axi Playhouse. We have seen playhouses in a similar style from Axi before, but the extra large size of this one makes it really stand out. That extra room, we are sure is going to go down very well as you could add in a table and chairs and the kids will still have a lot of room to run around. The ladder and slide will of course provide a lot of fun and we are sure they will enjoy running around on that decking. 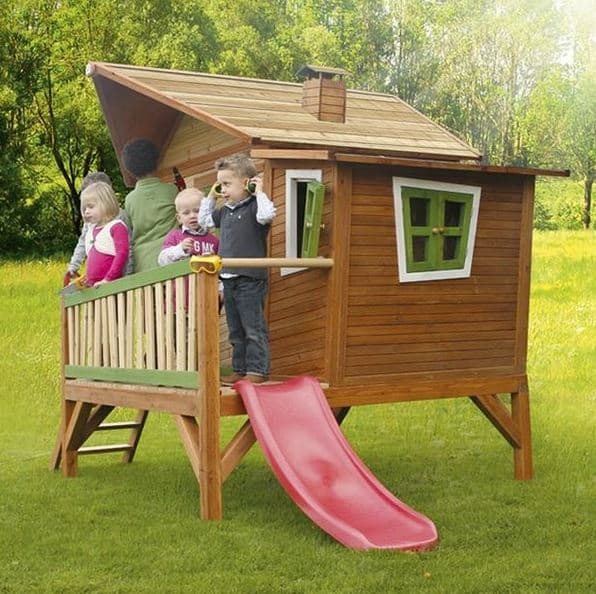 The price may be a little on the high side, but we feel this is one playhouse that is well worth its price tag and we actually highly recommend this if you want something that has a fun and unique style as well as a lot of room for playing.